Experience unparalleled views of Victoria Falls and the rapids of the Batoka Gorge as you ride a zipline over the Zambezi River. 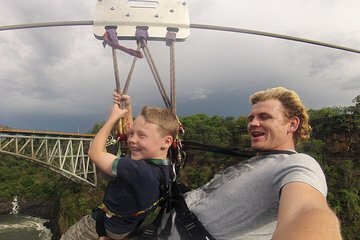 This adventure begins on the Zambian side of the Victoria Falls Bridge and sends you zipping under the bridge’s majestic arch to a platform on the Zimbabwean side. The slide is exciting but glides slow enough for you to take in the views and snap selfies along the way. Free return transfers at 10am and 2pm. Minimum age 14 years and all persons under 18 years must have the written consent of a parent or guardian. Not suitable for persons who are either pregnant, epileptic, hypertensive or have a previous knee or back injury.